Mepps Marabous will catch a variety of game fish. Their wide #5 Colorado blade brings the lure close to the surface during the retrieve, making these spinners ideal for fishing over weeds, or those times when a lure should just break the surface as its blade spins. Both largemouth and smallmouth bass, as well as big trout, salmon, walleye, northern pike and musky will take a Mepps Marabou. 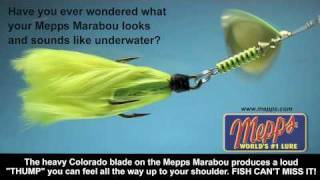 In addition to the flash and vibration of it's heavy Colorado blade, every Mepps Marabou has the action of a top quality, brightly colored marabou tail for high visibility and lifelike movement. The Mepps Marabou was designed to easily fish water missed by many fishermen. While the medium-running Mepps Musky Killer is "old reliable" to musky anglers, and the heavier Mepps Giant Killer, with it's willow leaf blade, runs deep and casts easily, the Mepps Marabou was designed for fishing over weeds. A marabou tail also provides additional benefits. Marabou in the water has distinctly different characteristics than bucktail. Vibrant colors are easier to achieve when dying marabou. The real difference, however, is in the action and pulsation of the marabou. That unruly, fluffy puff of feathers becomes "magic" under water. It is so fine and soft that each revolution of the blade makes the marabou pulsate and appear to come alive. Серия вращающихся блесен Giant Marabou от компании Mepps – это настоящая находка для рыболова, который ловит крупную добычу. При анимации металлический лепесток очень активно вращается, создавая как колебания в водоеме, так и акустический эффект. Главная фишка Giant Marabou – большая «юбка» из пышных перьев, которая создает дополнительные колебания, провоцирует хищника на атаку и прячет крючок. Также эта юбка зрительно делает блесну более объемной. Блестящий корпус в воде бликует как чешуя настоящей рыбки. «Вертушка» обладает внушительным весом - 40 гр. Такой вес позволяет стабилизировать анимацию на течении и облегчает заброс блесны на нужное расстояние.